A new bug spray isn’t worth Peter’s suffering… Peter is more important than products. Yours and mine. His name echoes in my head and heart for so many reasons. 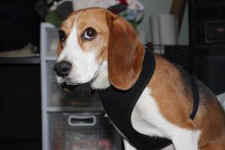 I have rescued so many of these tormented beagles from laboratories, but Peter has broken my heart more than any other. He was part of the Vegas rescue last May and went to a foster home. He did not do well there and was transported to me. When he arrived he was visibly shaking, salivating, tail between his legs, and would not look me in the eye. He ran to a corner and shivered in utter fear. When I gently approached him, he ran. He ran fast. He ran so fast and scared, he ran into things because he was so hysterical. The laboratory he was from "warned" us about these dogs. They said, "They have never been touched." They said, "They really should just be euthanized." They said, "Take them at your own risk." We did, and I'm glad we did. For the next two weeks, I would watch as Peter evolved. He absolutely loves other dogs, and along with our other rescues, he began to finally play with the puppies and the others. However, he was still deathly afraid of people. The only time I could touch Peter was when he happened to go into the rescue room and lay down on the couch. For some reason, when he was on that couch and I came in, he would freeze. I could touch him, sing to him, whisper that I would never hurt him and he would always be loved, but I could see him holding his breath; I could feel his fear. All I could do was hope, hope that soon, Peter would realize he was safe and could get and give love. We even had a wonderful woman come by to do Reiki with Peter which seemed to work. Following his session, he allowed me to come closer. When the other dogs would run to me, so would Peter, but then, just as he got close enough to touch, it was almost like someone hit the brakes, and he realized he was too close, and would run off. Peter's two week journey is captured in this video I made of him while here at the Beagle Freedom Project HQ. When I look at Peter, I can't help but get so angry at those people who made him suffer, who never gave him love, and who wanted to then simply kill him after the pain he had suffered. I pray that Peter will soon find the strength and courage to enjoy this life that he so truly deserves. Please share this, so that people can see the face of animal testing.